Back when EarthBound was released on the Super NES, the game came with a big ol’ strategy guide for free. 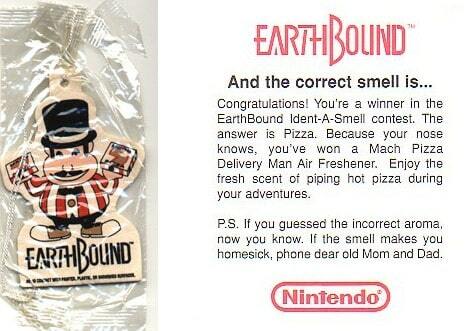 Inside the guide were some smelly scratch-n-sniff cards, and with one card, you had to identify the smell and send your answer in to Nintendo. Supposedly, if you got the answer right, you would get something. Apparently, the secret smell was “pizza”, though it always smelled like burnt rubber to me. Also, because of poor sales, I believe they gave the prize to everyone who submitted an answer, not just those who got it correct. The prize, of course, was a Mach Pizza air freshener. Not many were made, and not many people submitted answers, so there aren’t too many of these out there nowadays. Until recently, nobody made a big deal out of them, but they’ve suddenly gone up in price like crazy on auction sites. Here’s one such example. Just earlier this year, reid gave one of these out as a contest prize at Starmen.Net. I don’t think anyone expected these things to jump in price THIS much though. But I guess they’re pretty limited in number these days, so who knows. Whatever the case, if you manage to get your hands on one of these, hold on to it! It’ll probably be worth a bit more over time. That’s when you sell. Kind of like with EarthBound carts. Man, has EarthBound merchandise turned into the stock market or what? POLL: How much would you pay for a Mach Pizza air freshener? if i get this will i rule the world? Man, makes me happy I got one back when they were selling for acceptable amounts. So the air freshener smells like burnt rubber too? I’m putting Mach Pizza Man in the same category as Waluigi: total creeper. It’s just so freakin’ bizzare, I mean I looked up on EBAY & some dude wanted $300 bucks for it. Don’t get me wrong, it’s awesome lookin’ & would totally be dangling from my rear view mirror if I owned a care. I like the smell of Pizza and all, but I don’t think I’d spend 300 bucks just to get that smell while driving in the car I don’t own and can’t drive. I submitted my card to Nintendo about 13 years ago, and my guess was actually “burnt rubber”. Seriously! When I finally turned 16 I hung the air freshener up in my car, but when my mom borrowed my car for a day she tore it down because she didn’t want to be seen with it. Thus, my air freshener was destroyed-ish and can’t be hung up again. My mom has since apologized, because she’s actually a pretty good mom. I got it for like, nothing at all (my best friend got it for me as a present). I cant drive yet (I am 11) and if I had that money I would get it. I voted nothing. I like the smell of pizza, but I don’t want an air freshener. I’ll bet there’s still a whole box of them in some broom closet at NoA’s headquarters in Redmond. Seriously. With as much as they invested into the game, they probably prepared for the best, and had a whole bunch made just in case. One of these days, some intern is going to stumble upon that box, put them on eBay, and the price will plummet.